Like the Gershwin song titled by the same name, this pretty pieced quilt can be enjoyed from close up or far away. 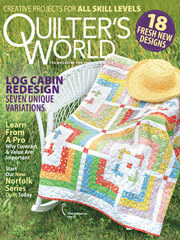 This e-pattern was originally published in the August 2009 issue of Quilter's World magazine. Size: 63" x 75". Block: 12" x 12".